#1.1 How to Choose the Most Accurate Reloading Scale? #1.2 6 Best Digital Electronic Scales on the Market! #1.3 6 Best Mechanical or Balance Beam Scales on the Market! #1.4.1 Why you need a reloading scale? #1.4.2 Why does everyone measure powder in grains? #1.4.3 What else can I measure with the reloading scale other than powder charge? #1.4.4 Digital vs balance beam reloading scale – what to choose? #1.4.5 How accurate are digital reloading scales? #1.4.6 How to take care of a reloading scale? #1.4.7 What is the best powder scale for reloading? If you are a person who creates your own ammunition you probably have realized that there is a big savings in reloading your own cartridges. Not only is it away to create ammunition that is often times more accurate than what you would get from the manufacturer or in the store, but there is a considerable savings that can be made when you were buying the materials to make your own cartridges. However, that savings can quickly be lost if you are not accurately measuring out such things as gunpowder. Your great cost-saving endeavor can quickly turn against you and this is why it is important that you get an accurate scale to assist you in making sure that your gunpowder is not wasted. Buyer’s Guide : How to Choose the Most Accurate Reloading Scale? Type of Scale. There are two primary types of scales that you can purchase: digital and mechanical or balance beam. The digital scale is one that is measuring your powder electronically, while the mechanical or balance beam scales are allowing you to do this manually. Some find the manual more accurate, it’s really a question of what you like best. Sensitivity. No matter which kind of scale your speaking of, you want to look for something that provides you with a great deal of sensitivity, at least 1/10 grain inaccuracy. This will give you great precision and ensure that you don’t have waste. Capacity. Whether you are planning on doing a small number of cartridges or a big batch, being able to weigh the amount you are looking for at any time is an important consideration. Make sure you get a capacity that fits how you reload your cartridges. Durability. If you are a person who reloads your cartridges while you’re out at the range or out on a hunting trip, then you need something that’s going to be durable. The more mobile you need your scale to be more durable you needed to be. Price. Of course price is always a concern. While you want the highest possible quality scale, you also want to get one that works well within your budget, so having an idea of the other kinds of factors that matter to you most will help you to determine what you can afford. I completely get that you may read dozens of these kinds of reviews each and every year. The people that review these articles assure you that you can have absolute confidence in their integrity and honesty, but how are you to know that it’s true? This is an exceptional question, and is one that I would hope you would have as you read this review as well. You don’t know me, and so you are hoping that the information I provide is something you can trust. Let me assure you that you can. I do not work for any company that produces or sells the scales. I am simply a guy who has been an avid marksman and Hunter for about 45 years. About 40 years ago, my dad taught me to be able to create my own ammunition and it has become more than just a hobby sense. It’s an obsession, because I love being able to have the most accurate rounds, and personally being able to create them myself has enabled me to be able to do this. It is for this reason that I have done much of what you’re doing right now. 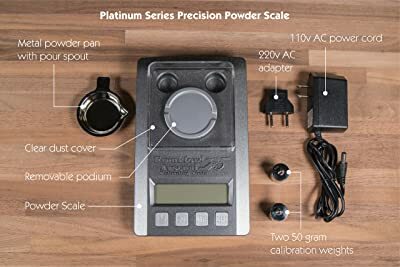 I have read reviews, tried out many different products, and consulted friends and family looking to find the perfect equipment, including the perfect scale for measuring out powder. This is why you can have some confidence that the information I am providing is something that is of value to you. I have taken my personal obsession and expertise and written this review to assist you in finding the best scale for yourself, I don’t make any money off this, I just get satisfaction being able to provide what I have learned to you. 12 Best Powder Scales on the Market! Now that you have some ideas about important factors to pay attention to when choosing a scale. While the digital scales can be a great option, as you have seen many have issues with their ability to zero out. This was my personal favorite digital electronic scale that started with a fantastic design. It was easy for me to be able to load in the gunpowder and then choose the display screen to set exactly how much powder was to come through the device and onto the scale. It was able to hold at least 1 pound of powder in the hopper and is perfect for those using smokeless powder. The precision of this scale is +/- 0.1 grains and I was able to dispense anywhere from between two up to 300 grains. The precision of the scale is amazing, ensuring I got an accurate amount of powder for every time that I measured, perfect for those who want to ensure they are not wasting powder during reloading. 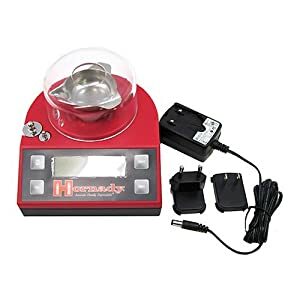 Extremely fast in terms of your ability to get the powder amount you want to weigh out correctly, and the display is easy to use so that you can get the exact kind of measurements you are looking for. You will be amazed at how quickly this cuts your reloading time, and you are able to use it with the multitude of different kinds of powders. A great design that is extremely durable. You can easily take this anywhere, and it allows you to use batteries to keep it charged on the go. Absolutely loved it. If you are looking for a well-designed scale that has the capacity of 1500 grains, here’s the choice for you. It is perfect for any reloading bench, and comes with a plug that gives you three different kinds of outlets to use in almost any kind of socket. You can literally take this anywhere, and I mean anywhere across the globe. There is a large LCD display, which makes it easy to read and it is lit, so even if you were out creating cartridges as the sun is going down, you can still get a good reading with your powder without giving away your position. Plus, it gives you precision up to one tenth of a grain. You can easily weigh bullets, powder, cartridges, cases, and much more. Included with the scale are a variety of measuring tools, which not only include micrometers and calipers, but you also get tools that allow you to measure rim thickness, the seating depth of your bullet, and other tools that help to create uniformity in each cartridge you make. This is a great scale built to give you an accurate card each and every time. You also like the fact that is so small that it easily fits on your workbench area without taking up much room. This is a great 300 grain powder dispenser, which has an accuracy up to 0.1 grains. It is specifically built for everyone, no matter whether you are right-handed or left-handed, and you will love the fact that it is easy to get an accurate amount of powder with each setting. Dispensed from the hopper, powder comes onto the tray as you determine, giving you the exact accurate measurement you want each and every time. The LCD display is easy to read and easy to use. This is one of the things that I really loved about the scale, because it took a very short learning curve for me to be able to get the amount of powder I needed and every time. The interface is just excellent, and you will love how responsive it is. Setting the calibration is easy. It is a durable device that enables you to be able to take it with you wherever you want. Battery-operated if you so desire. I personally like the fact that it was built as a rather small device, making it easy to store on my workbench or to take with me. Really ideal for the on the go hunter. If you want something that is much more than just a scale, then this Frankford option is exactly what you are looking for. Not only do you get a fantastic case to protect your scale and make it easy to take with you, but you get incredible calibration at this, as accurate as .01 g. The capacity is 1500 grains or 100 g and you have two different calibration weights making it so that you can measure in either grains, grams, carrots, or ounces. This is a fantastic scale. This is one of the easiest scales you will find to use, which can either run on 110 V, 220 V, or by using for AAA batteries. It will automatically shut off after 180 seconds of idle time making sure that your power is not wasted. Plus, you will like the fact that its size makes it that you could store it virtually any place, even when it is out of the case. 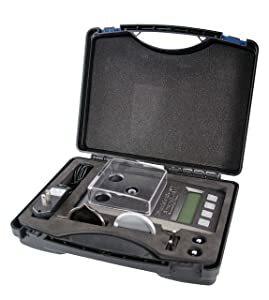 Included with the scale and case, are calibration weights, a metal powder Pam, a storage case, the adapters for power supply, and a clear protective cover. 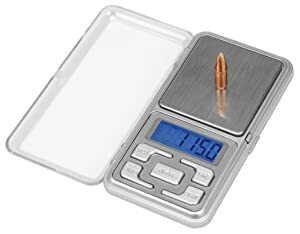 This is a scale that is specifically built to give you maximum potential in terms of the hand loads you are creating, and you will love the fact that you can take this with you anywhere you go. Plus, it has a large black lit display that makes it easy to read no matter where you are. This is a great portable scale, powered by the use of two AAA batteries. This is a very small digital scale that weighs up to about 20 g of any substance, allowing you to increase or decrease in increments of 0.001 g.
Included with the scale is a carrying case that also provides you with such things as tweezers, calibration weight, and a tray. They flip down shield protects the scale, so not only do you get accurate measurements but you do not have to worry about the scale being damaged, as this is an extremely durable and hard plastic. There are six different weight units that you can use, including ounces, grams, and grains among three others. The diameter of the scale is 1.3 inches, and is made of a strong stainless steel to give you a great scale. There are separate on and off buttons, along with an easy to read LCD display. The user guide is easy to follow, and included are two different 10 g calibration weights. What many have liked is that the company has completely redesigned the weighing platform, making it much more accurate and easy to use. Not only can you weigh powder and cartridges, but virtually any kind of material you would like, as I was even able to weigh tea extract and different supplements I have been using to improve my health. This is the easiest digital scale to take with you, as it comes as a case that is about the same size as your cell phone. This is a scale that provides accuracy up to 50 g capacity, with a 0.1 grain accuracy, and it is auto calibrated and also comes with an overload protection which ensures that you do not have to worry about the scale getting damaged. It will simply give you an error message if there is too much weight on the scale. The digital LCD display is easy to read, and contains a blue backlight that improves ability to read. An auto shut off occurs after 60 seconds of nonuse, and it is powered by using two AAA batteries. The scale allows you to measure and one of four different units, which include grains, grams, ounces, and carrots, and it provides both tare and counting functions. Despite being a small scale, it is an extremely durable one that comes with a protective cover to not only ensure that the scale is protected but also to ensure that the mechanisms inside are protected so that they do not become damaged. Included is a powder pan, a calibration weight, and a soft carrying case. The fact that it performs so well and is easy to transport makes it a worthwhile scale to take with you no matter what purpose you need it for. Out-of-the-box you are able to use it, and you will enjoy how simplistic it is. 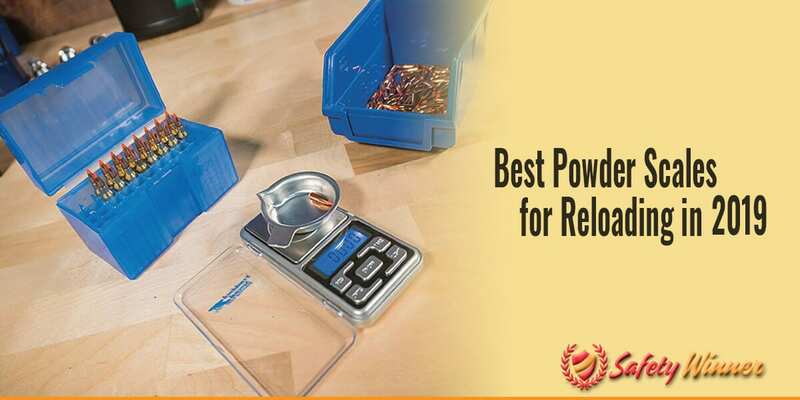 If you are a person who prefers to do things manually and wants what is the best reloading scale on the market, then you are really going love this one. This comes with a 511 grain plus a 500 graying counterweight that enables you to be able to weigh over 1000 grains. The 10-10 has a lockable micrometer that makes the accuracy of the weighting system even more accurate. There is no need for a battery or any kind of power source. You get an accurate scale out-of-the-box that is dependable and ensures that every measurement you take is exactly what the weight is. Also, because of how durable it is, you can take this scale anywhere you go making it ideal for those who like to create their cartridges while they are out on the range or out in the field. For those who love the accurate measurement of doing things mechanically, this is one of the best you’re going find and, best of all, you can use this to measure just about anything. No limitations here. I am frequently asked questions by friends and family related to issues or purchases, and so I have put together a list of some of the common questions I receive related to reloading scales. Hope these help. #1 Why You Need a Reloading Scale? If you are going to be creating your own rounds then a reloading scale is absolutely essential. You have to be able to accurately measure the amount of powder you are using in each cartridge, and a scale is the only way you can do that. This also helps you to prevent wasting powder which can become a costly mistake. #2 Why Does Everyone Measure Powder in Grains? The reason behind this is simple. To throw charges with a minimal amount of variation, you want to make sure that you have the same charge for the powder each and every time. To do so, you are looking to get as accurate of a measurement as possible and grains is far more accurate than any other standard unit, especially that of grams or ounces. As an example, there are more than 15 grains in every gram, which would be much harder to determine if you only needed one fourth of a gram. It makes much more sense to simply go with the grain measurement to get the more accurate value. #3 What Else Can I Measure With the Reloading Scale Other Than Powder Charge? The truth is that you could measure just about anything. It really depends upon the kind of scale you’re using, as some are not able to measure liquids, but we have seen in this review that I actually used a couple of the scales to measure other kinds of substances. Something not allow you to measure the water volume for cartridges, and you will likely find that in many of the digital scales this will be an issue. Far less of an issue in the balance beam or mechanical scales. However, it is important to note that you should not be using your scale to measure others kind of substances than the charging powder. The reason behind this is simple. Even the smallest amount of residue from another substance can deteriorate or corrupt your charging powder, which could have catastrophic results. Make this a single-purpose scale. #4 Digital vs Balance Beam Reloading Scale – What to Choose? There are those who choose the digital scale simply because it is the easiest to use. No argument with that whatsoever. Once you have zero the machine, these can become the easiest things to use. With some scales you simply choose the amount of powder you wish to have dispensed and weighed and it will provide that for you. Some make it easy to simply pour in the amount that you need and get an accurate measurement. However, I happened to be one who is a strong believer in the mechanical scales. These are much easier to zero, and provide less issues for you. Plus, you don’t have to worry about any kind of power source. Overall accuracy is not as solid, I will agree with that. It’s simply a matter of what you’re used to and what you like best. #5 How Accurate are Digital Reloading Scales? What we saw is that most of the digital reloading scales give you incredible accuracy. You are able to measure in the 0.01 to 0.1 grains of accuracy. That’s pretty exceptional, and something that no mechanical scale can provide you with. For a person who is looking for the absolute most accurate amount of charging powder with each round they make, you simply can argue with this. #6 How to Take Care of a Reloading Scale? As with any tools, the better you take care of it the better the device will be. You should always store your scale in a place where it is kept secure, free from getting damaged, and free from being knocked over or continually bumped against. The more wear and tear you subject your scale to the less likely it is to be accurate for you. Always clean your scale after you’re done using it. This can simply be done by wiping down the scale with a dry paper towel when you are done using it, or cleaning it with a solution of a mild soap and water. You can even use alcohol rubs. Simply make sure that you treat your reloading scale with the greatest amount of respect and it will last for you for years to come. #7 What is the Best Powder Scale for Reloading? Actually it depends on what you like. All of the ones on this list are built with durable materials, so you want to invest in something that’s going to be around as your enthusiasm and desire to hunt or to shoot competitively are increasing. One of the best things you will love about these kinds of scales is that they are built to last. If you care for your scale and buy a quality product, you can be sure it will be around for that long. That was a lot of information for you, but it was good stuff that should help you on making the right decision on the kind of reloading scale you need. Just make sure you take the time to decide on what works best for you – digital or mechanical, as well as other factors – and you will have the scale that can work for you for a decade or more. This review was intended to give you some good information, and I hope I’ve done that. Just remember to be smart and safe in everything you do surrounding the use of your weapon, including the reloading of your cartridges. Do that and your experiences will be better than ever and you will have great ammunition, great equipment, and great fun. Top 7 Factors That Affect Your Reloading Scales Accuracy!